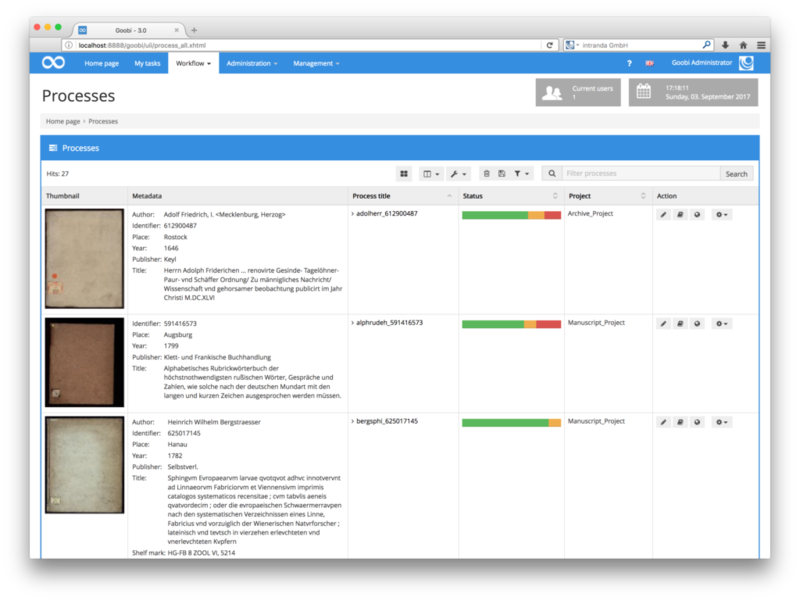 The process list has been updated so that users can choose to display a thumbnail and selected fields from the descriptive metadata in addition to the title, project name, creation date, ID and status. Goobi will display the thumbnail which has been specified as the representative image in the Metadata Editor. If a representative image has not yet been specified, Goobi will display the first image in the stack. 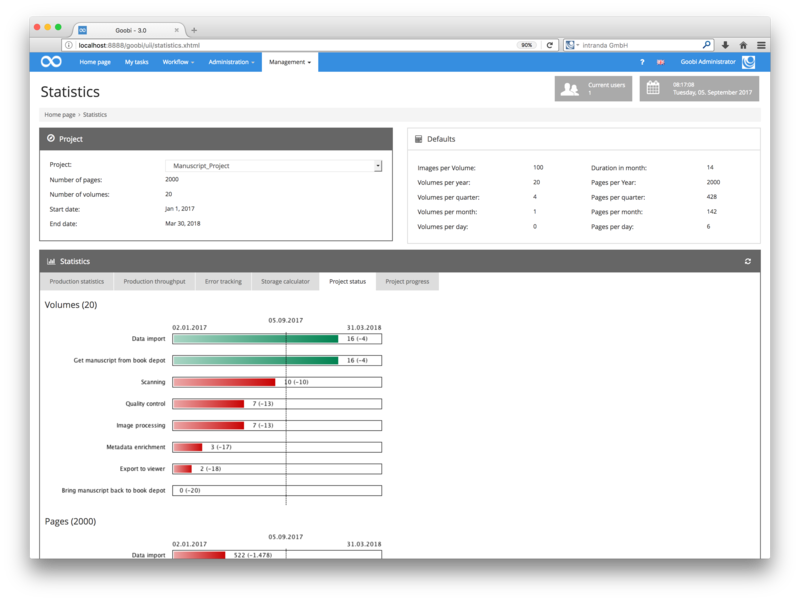 As an alternative to the usual process list in tabular form, there is now an option to view processes in the form of a grid. Unlike the tabular view, the focus here is on the actual object and its metadata. 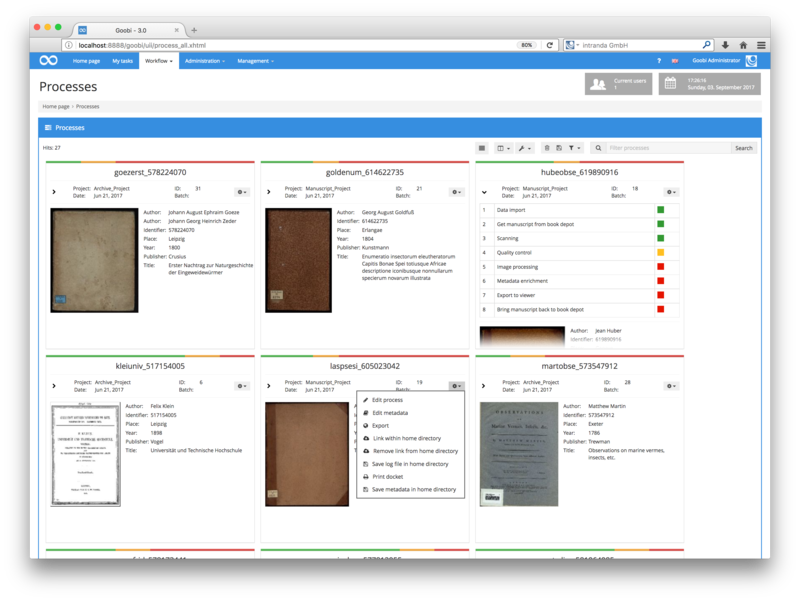 Grid view is particularly useful if you require a clear overview of museum-related content. Although you can access all the usual Goobi functions in grid view, some may be in a different location due to repositioning of the operating components. 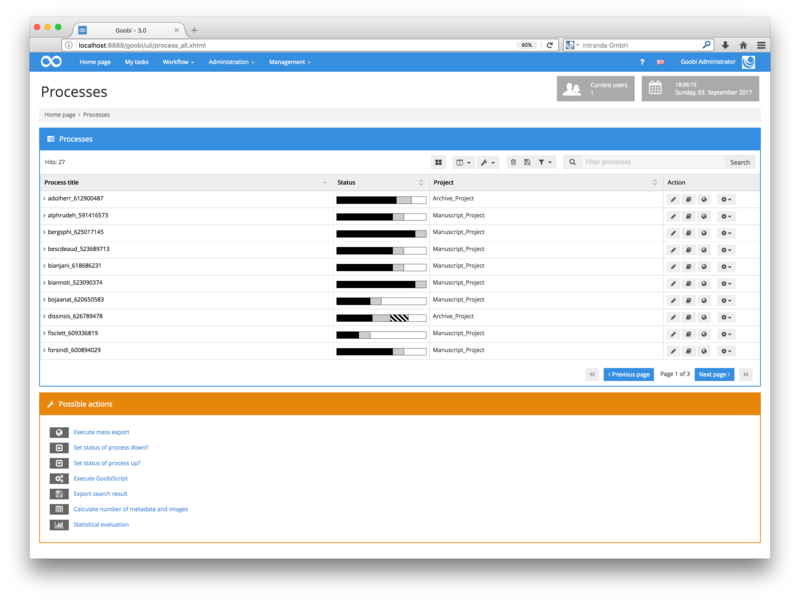 The way properties are displayed within the ‘process details’ view is now more intuitive. Properties that have been configured with a default value for use in workflow steps will no longer be shown with that default value unless it has been confirmed by a user. 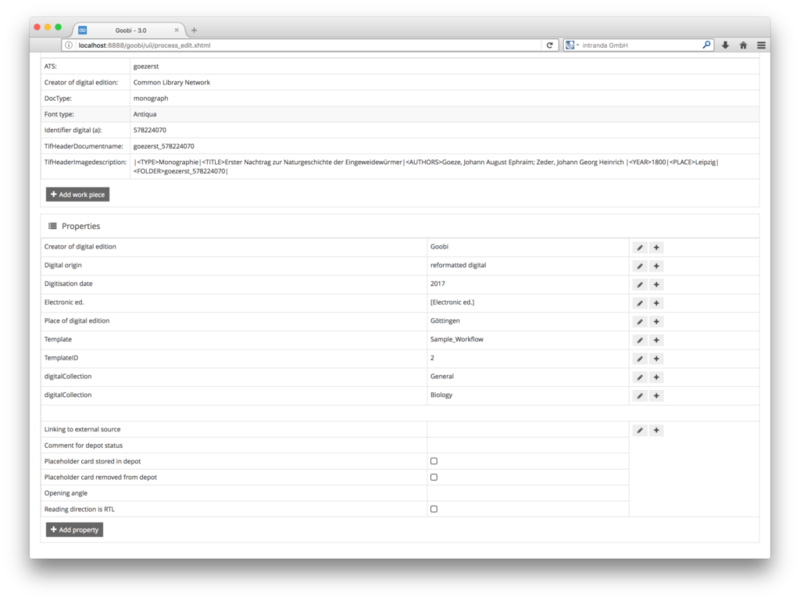 Users can now see immediately if properties have been configured in principle for a process but not yet defined (i.e. if the corresponding field is still empty). 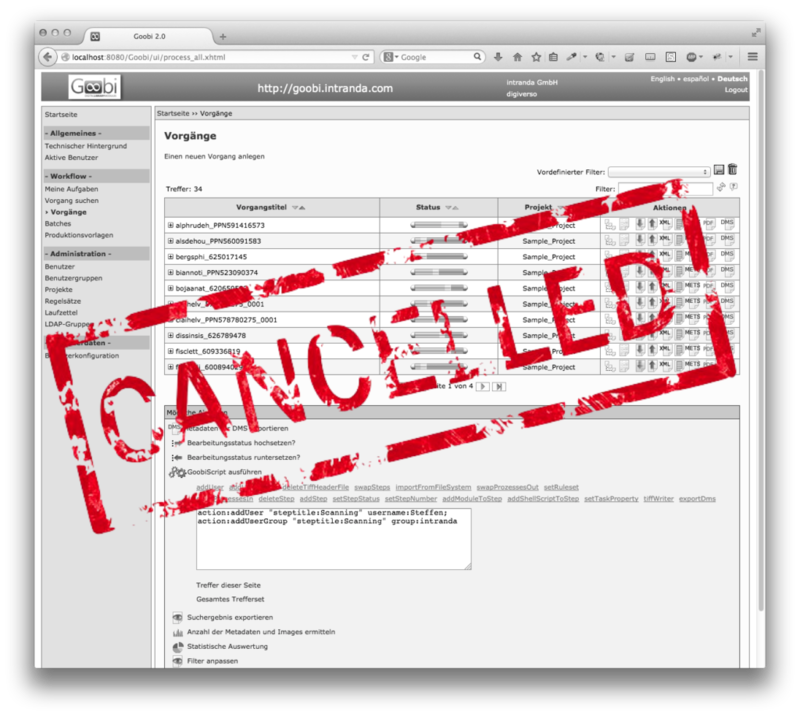 Display problems sometimes arose in earlier versions if long titles were used for individual workflow tasks with the result that some of the data was difficult to read. The task list within process view has been modified to prevent this from happening. From now on, even long titles will be clearly displayed. 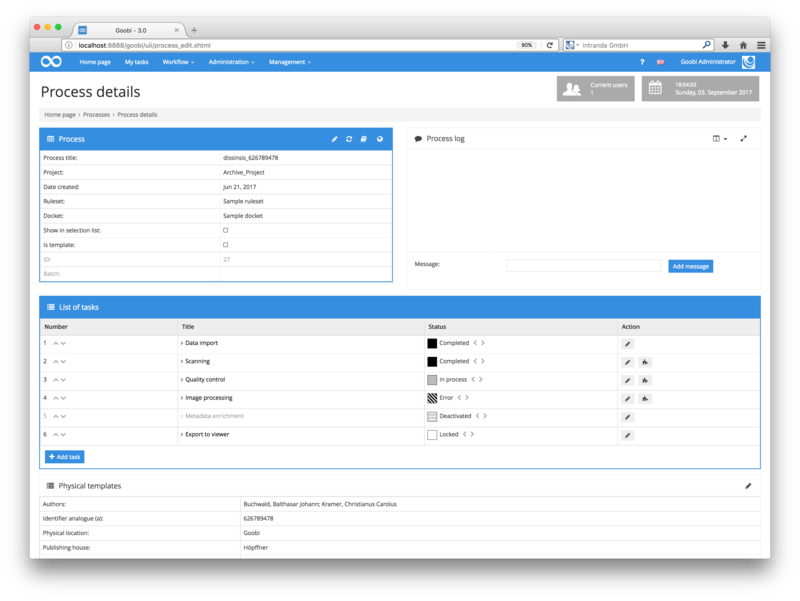 After a migration period of three years during which we introduced a new, modern, web-based interface, we took the decision to remove the old GUI from the program to coincide with the release of Version 3.0. Goobi 3.0 includes a high-contrast mode to make it easier for those with colour recognition difficulties to use the program. Low-vision mode can be activated from the top-right menu. Information in process view and in the process task lists is displayed in high-contrast mode and with explanatory labels. Users can still change the shortcut from & to a preferred key combination in the user configuration menu. The new shortcut will then apply to the Metadata Editor and in the rest of the program. After the new GUI was introduced, the login form no longer contained a note explaining what to enter. This omission has now been resolved. Previously, there was no recognisable difference in the ‘breadcrumb’ trail between processes and process templates. The headings have now been modified to avoid misunderstandings. 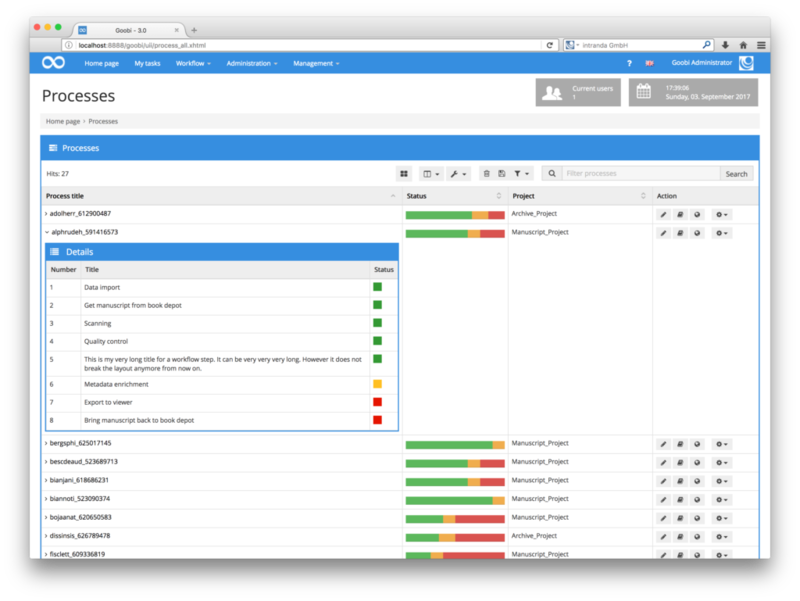 We have also made some changes to the workflow details view. For example, the overview now includes configured plugins and script calls so that users no longer have to open the task details. The processing of workflows has also been modified. 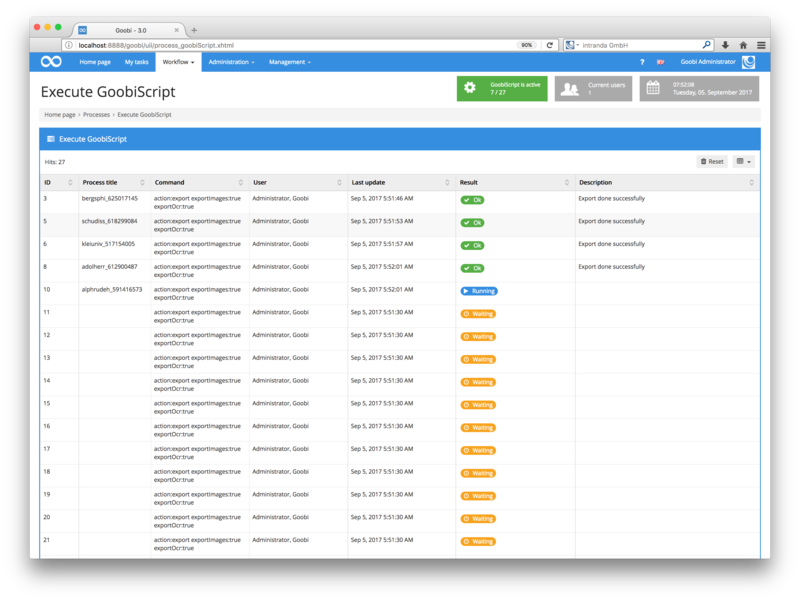 In Goobi 3.0, nearly all the actions performed for individual process are now stored in the process log as internal system messages. This makes it possible to fully reconstruct the sequence of actions if necessary. To make working with the process log easier, it can now be displayed in extended mode. This avoids the need for scrolling and allows users to search through messages more efficiently. With Goobi 3.0, users can also activate additional fields to record messages. Depending on the purpose for which Goobi is being used, each entry in the process log can now contain multiple fields. The way CPU-intensive and time-consuming GoobiScript actions are processed has been extensively revised. As an additional layer of security when executing large-scale GoobiScripts, we have introduced an arithmetic confirmation procedure in the form of an addition sum. The requested GoobiScript will only run when the correct answer is given. Once the GoobiScript starts, it will simply run in the background. This avoids the need to take a break if the script in question runs for a considerable time. It also means that one user can start a GoobiScript running, and another user can later check the progress of the script on another computer in a different user session. Errors in specific tasks can also be traced much more effectively as users can now display the results of GoobiScript calls and download them in Excel format. Alongside the individual workflow task properties with which users are already familiar, users can now instruct Goobi to update the internal statistics for the associated process once the task has been performed. This option is particularly useful for statistical analysis purposes in the case of fully automated workflows and others involving mass imports. Two new statuses have been introduced in Goobi 3.0 in addition to ‘locked’, ‘open’, ‘in work’ and ‘completed’, which featured in the earliest versions. ‘Deactivated’ status allows users to include tasks in the workflow even though they will not be executed at that stage. However, this status may be changed by a plugin or script as the workflow progresses, at which point the task is activated if a certain property condition is met. The new ‘error’status will be used from now on in Goobi to denote a failed task. This may be useful when executing scripts or plugins and for correction messages, as users will be able to check the status directly. The procedure for deleting projects has been revised as an additional security measure. In Goobi 3.0, projects can no longer be deleted if they still contain processes or users. This will prevent any accidental deletion of processes or users. There is now a very simple procedure allowing administrators to send important messages to all Goobi users who are currently logged in. The message entered by the administrator will be seen immediately by all users in every area of Goobi. It can also be shown on the login page to draw attention to maintenance work. 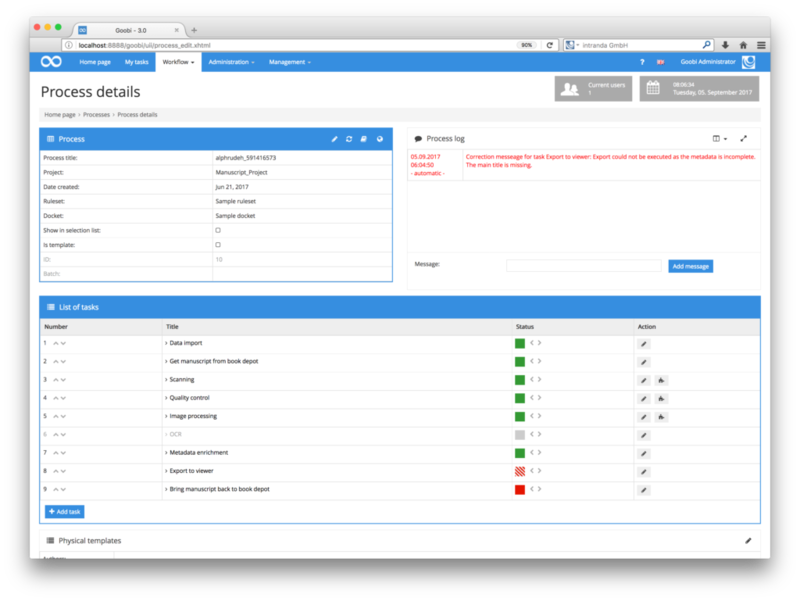 Project status view has been modified to show additional statistical information. As well as the number of pages and volumes completed to date, the diagrams now indicate the number of pages and volumes still outstanding. 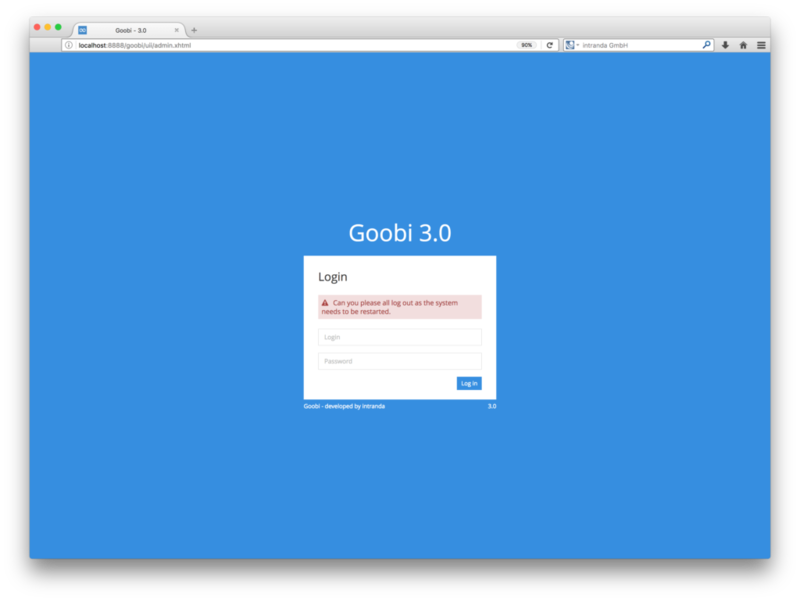 Goobi 3.0 includes improved encryption of stored passwords for Goobi installations that have not linked their authentication system to an LDAP server or active directory. There has been a huge extension of the internal authorisation system used to regulate which areas of Goobi can be accessed by the members of user groups. Instead of the previous system, which was based on just three different authorisation levels, all the main functional areas in Goobi can now be managed using individual authorisation levels. In Goobi 3.0, it is now possible to create entirely new user groups that are restricted to certain areas or that have access to specific administrative areas from which they were previously blocked. This extension of the authorisation system means, for example, that individual plugins can now be activated for certain user groups only, and that processes can be created without project manager rights. If pagination is carried out using the thumbnail display, clicking on a page now automatically selects the page allocation checkbox so that users no longer need to scroll to the required checkbox in order to activate it. When pagination has been completed, the assigned page numbers will be shown in the METS Editor’s thumbnail view underneath the corresponding page. This is particularly useful when generating structure elements. Thumbnail view has also been adjusted so that users can now display more pages on the screen at the same time. This was mainly achieved by minimising the unused right margin. In earlier versions of Goobi, the structure tree on the left-hand side of the METS Editor was only updated occasionally. In Goobi 3.0, it is updated much more frequently so that changes to metadata and page allocations that were previously displayed with a different status are now shown immediately and consistently. The various input fields in the METS Editor can now be extended using plugins. As well as all the usual field types for input fields, selection fields, large text boxes and lists, it is now possible to configure the way data is entered using dedicated search masks with options for selection by the user. This method has already been used to incorporate a user interface for integration with the GND authority database and with Geonames. Goobi’s redesigned system of user rights has made it possible to implement a frequently requested option in the METS Editor. 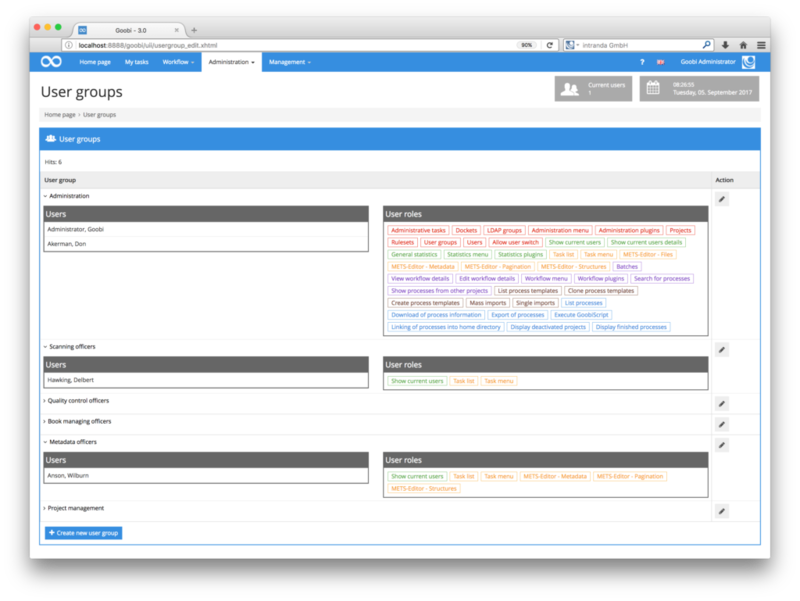 From now on, administrators can issue separate rights to different user groups for the various areas in the METS Editor. 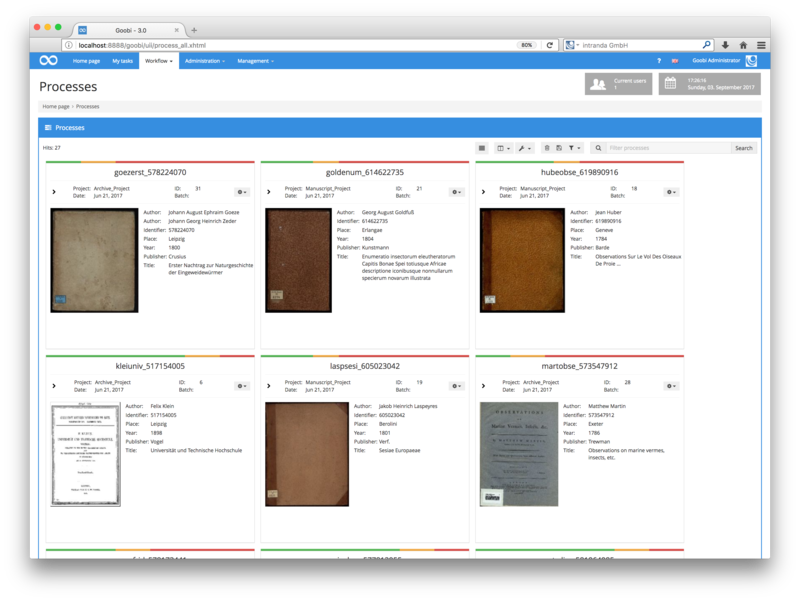 As part of the overall workflow, one user group might be authorised only to perform the task of pagination, while another might also be given access to the structure data and metadata. Alongside all the existing plugin types, Goobi 3.0 introduces a new type of plugin (with a dedicated authorisation level in the new system of user rights) that can be listed in the workflow menu. 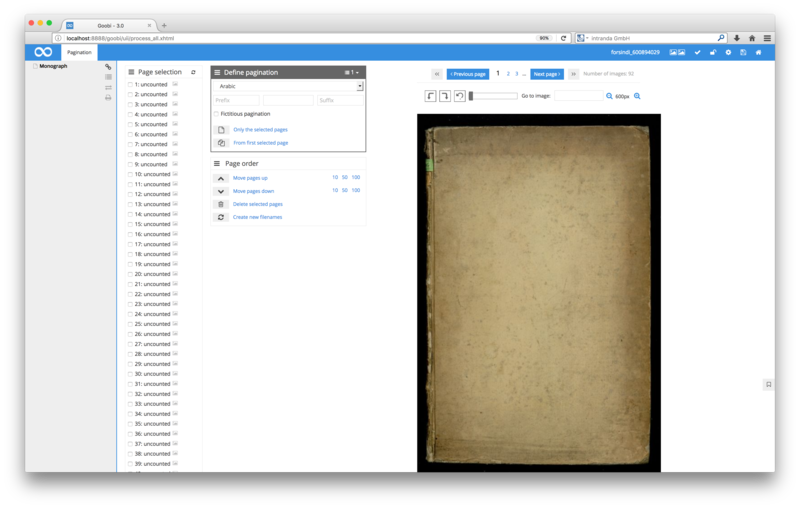 A new workflow plugin has been developed to make the task of reading in large volumes of data much easier. Users can now upload multiple images from different processes at the same time. Once the files have been uploaded, the file names are used to identify the correct processes and the previously configured task. Provided that the task status is currently set to ‘open’, it will be treated as a logged-in user. The associated images will be read in to that task so that it can then be completed. An administration data import/export plugin has been developed for use when exchanging data between two instances of Goobi. The user is free to choose the data to be exported from one of the instances. Even if the data is to be exported to another instance of Goobi, users can choose which data they actually wish to import. A new plugin has been developed to allow for the simple updating of ‘anchor files’. Using the plugin, anchor files marked as ‘master anchors’ can be copied to all other volumes. This means that information (e.g. from a periodical) can be updated centrally and copied to all the associated volumes of that periodical. 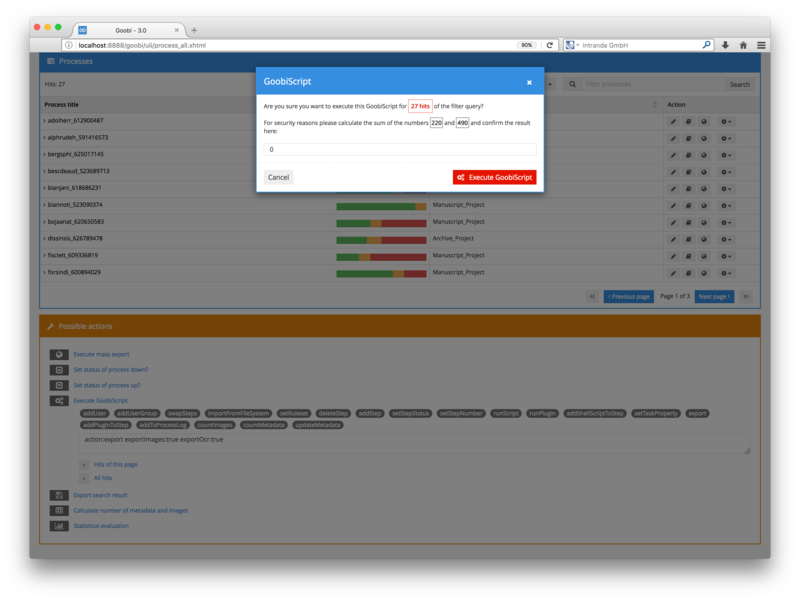 The functionality of the existing quality control plugin has been greatly improved. Additional functions can now be activated in thumbnail view so that users can access the image stack, e.g. to delete an image or rotate an image and save the rotated version. Multiple selection is possible if a user wishes to perform these operations on several images at the same time. 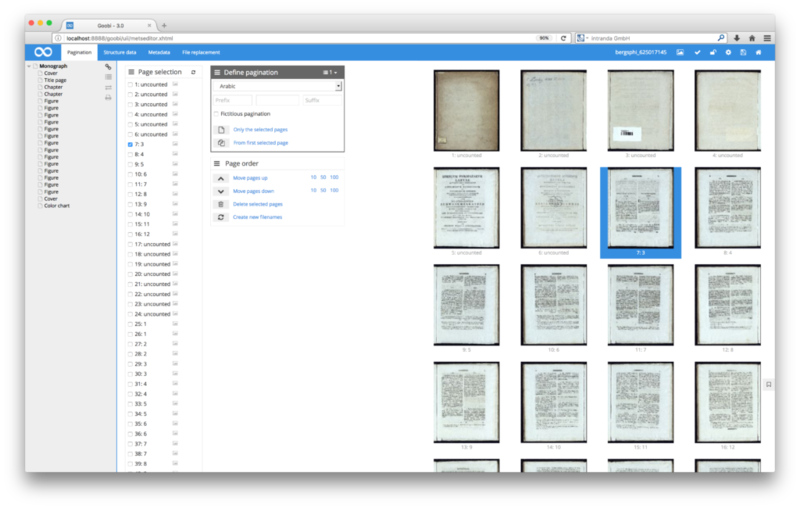 With Goobi 3.0, the images can now be downloaded and stored in pdf format. 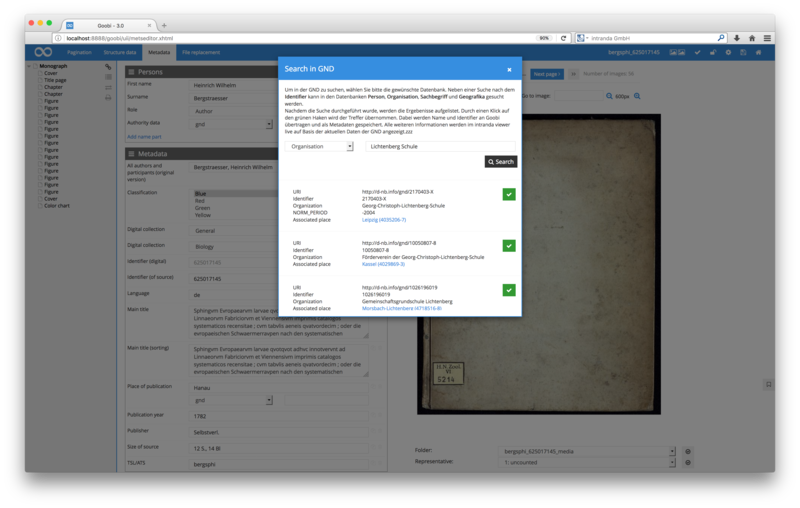 The upgraded plugin allows users to move between pages using key shortcuts and to navigate from within the revised full-image view. 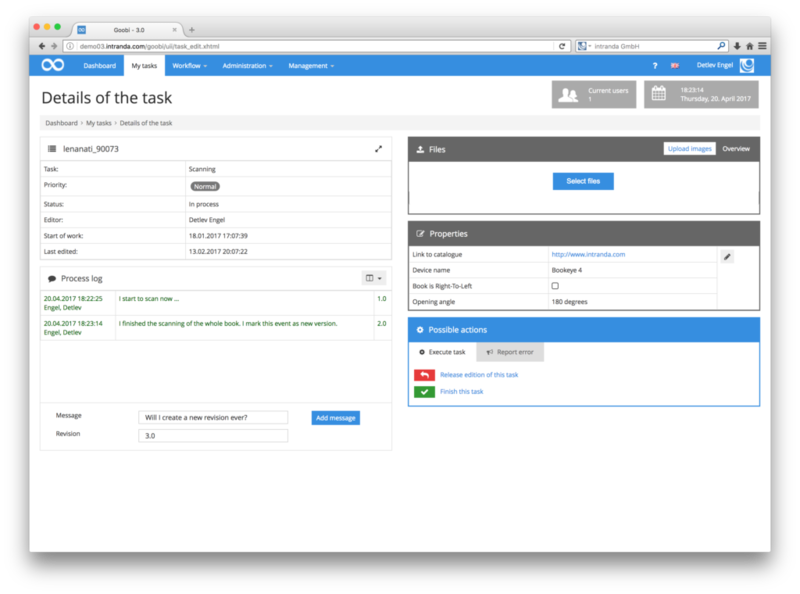 A new task plugin has been developed so that future tasks in the same workflow can be assigned to one or more specific users. Rather than the originally designated number of authorised users (e.g. in the allocated user group), the plugin makes it possible to specify exactly which users are authorised to perform the task in question.